At this point, there’s no need for me to explain the popularity of smartphone photography or how it has changed the way we share our daily lives. Apple’s competitors continue to release handsets that offer new and improved camera sensors – the Nokia Lumia 1020 and Samsung Galaxy S4 Zoom being the most recent – but the iPhone has always been the device to beat. iOS photography apps are released and updated every week, so keeping track of them all can be pretty tough (not to mention a little daunting). For our money, these are the essential apps to keep installed on your iPhone. Forget vintage filters, post-processing and the plethora of social networks waiting to be filled up with your awe-inspiring images. The act of capturing a photo is arguably the most important part of the entire process, so picking a decent camera app should be top of the list. Knowledge is power, and Camera+ offers it in abundance. 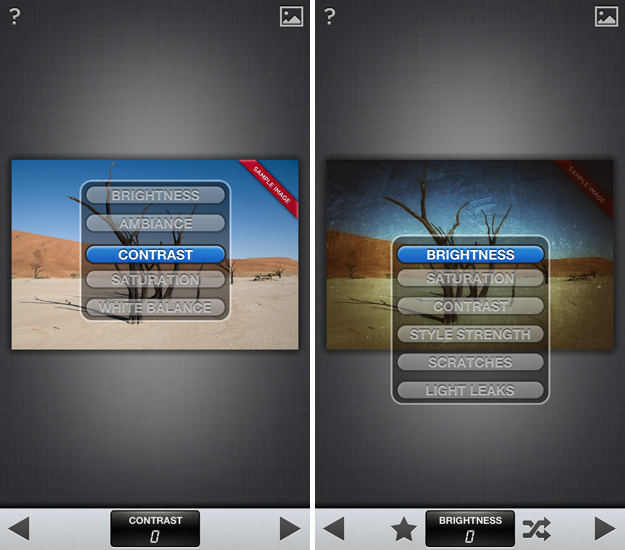 The app is one of a limited group that display the exact shutter speed, aperture, ISO speed and focal length. It’s not possible to change these settings – no iOS app can, for reasons unknown – but it’s still incredibly useful to have them on-screen. The digital zoom and flash options are shown at all times, but there’s also a trio of additional shooting modes that aren’t supported in the default iOS camera app. These are the timer mode, which can be set to a 5, 15 or 30 second countdown, burst mode and a stabilizer mode. All are pretty competent and worth utilizing when out in the field. That’s right, the camera app that comes installed on every single iPhone is also one of the best. It’s fast, lightweight and incredibly simple to use, which is part of the reason why so many photographers simply never look for an alternative. It’s also the best choice for capturing those one time only, spur of the moment images that occur when you least expect it. The default camera app is available from the lock screen – you can’t switch it out for any other app – which ensures that it’s always the fastest way to fire off a single shot. 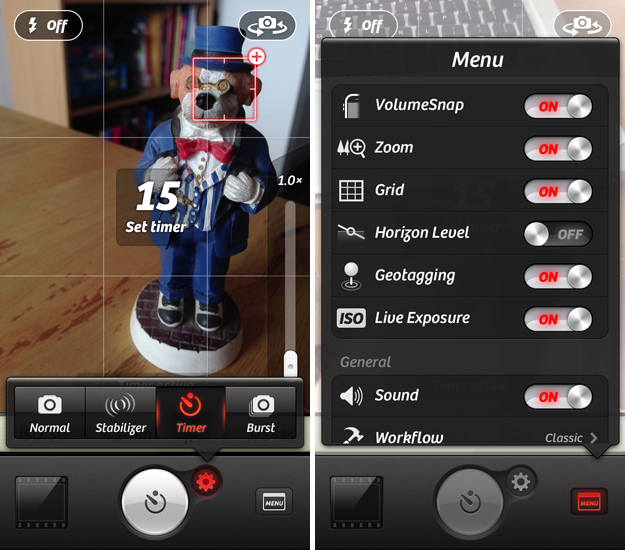 While there are plenty of camera apps offering specialized shooting modes, most of them look downright ugly. The interface is cluttered, or the creators have tried to emulate a traditional DSLR and ended up with a child’s play toy. Moment is beautiful. Six tiny circles line up on one edge of the screen, providing one-tap access to the flash, on-screen grid, burst mode, timer and more. The only notable omission is being able to set the focus and exposure point independently – a useful feature also covered by Camera+. Post-processing can sometimes save a terrible photo, as well as turn a pretty good image into something jaw-dropping. Emulating a piece of professional desktop software such as Lightroom or Adobe Photoshop is far from easy, but these app developers have nailed it. 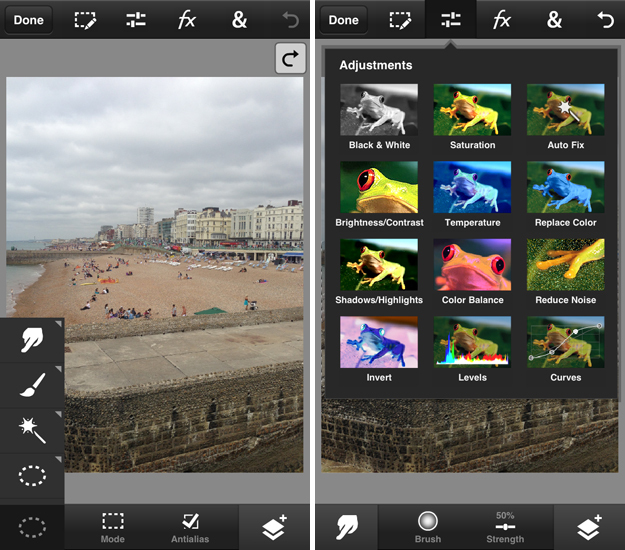 It’s not hard to see why Nik Software, creators of Snapseed, were acquired by Google in September 2012. 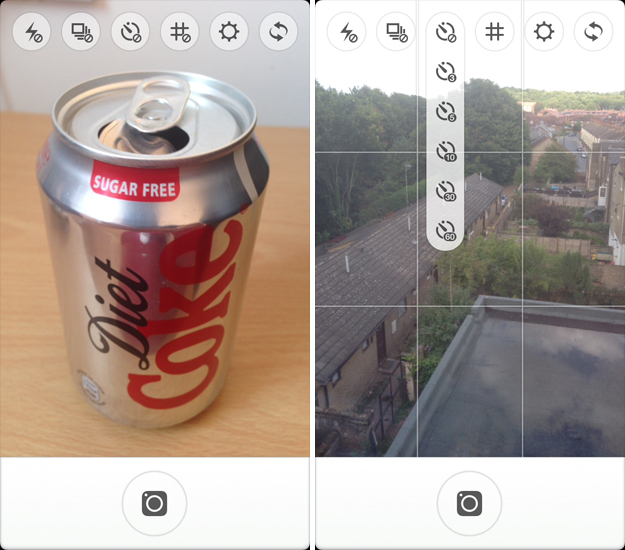 The app is like nothing else, giving users the ability to make ever so precise tweaks to the brightness, ambience, contrast, saturation, white balance and more. The interface is refreshing and intuitive. Users tap and slide their finger vertically on the screen to switch between different editing tools. Once selected, swiping from left to right changes the intensity of the effect. It’s a little jarring at first, but within half an hour you’ll find it hard to use anything else. Some of the biggest companies such as Yahoo, Polaroid and Squarespace have partnered with Aviary to leverage their professional editing features. The company’s own iOS app is a delight though, offering an expansive blend of filters, frames and light-hearted stickers. For the more serious photographer, there are also numerous options for altering the depth of field, brightness, warmth and saturation. It does it all, no questions asked. Some photographers will swear by the Adobe Creative Suite – or the Creative Cloud, as it will be known moving forward – so luckily there’s a mobile friendly version of Photoshop too. It’s the most advanced on our shortlist, but also the trickiest to use. Similar to the deskop version, users can choose from a dizzying number of selection options, as well as the clone stamp, blur and smudge tools. Color balance, shadows and highlights, brightness and contrast, temperature and noise tweaks – it’s all here. If you have some time to burn, this app will produce the best results. The beauty of smartphone photography is that everyone can see your work immediately. One tap and they’re uploaded to the Internet, where anyone can comment, ‘like’ and share them with their peers. Sometimes we just want our close friends to see our photos on Facebook, Path or Twitter, but if you’re looking for some constructive criticism these are our top apps to check out. The platform has dropped in and out of popularity in recent years, but Flickr remains one of the best photography communities on the Web. Yahoo gave its iOS app a major overhaul in December last year, followed by a similar revamp for its Android app and website. Users can review the most recent photos uploaded by other photographers and groups, as well as shoot a new image and apply some filters (supplied by Aviary). 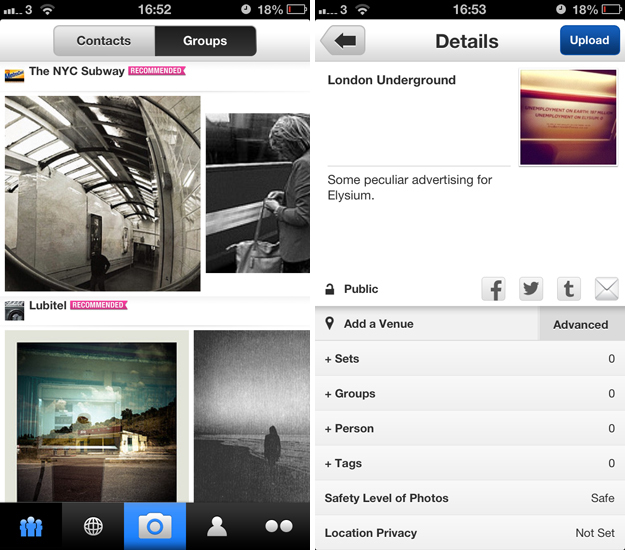 Best of all, photos can be added to an existing ‘set’ or group with geo-location data, tags and the like. If you’re still uploading photos to Flickr from a traditional DSLR camera, this is a fantastic way of keeping everything together. Instagram has a huge userbase and perhaps more importantly, people are opening the app and reviewing their feed on a regular basis. Instagram’s ease of use and uncluttered interface almost guarantees that your images will be noticed. Feedback, whether it’s a quick ‘like’ or comment, can be near-instantaneous and incredibly gratifying. The square-crop requirement can be a bit of a pain sometimes, but that’s partly why Instagram has been such a massive success. Throw in the hipster analog-inspired filters, hashtags and people tagging, and its a difficult service to ignore. 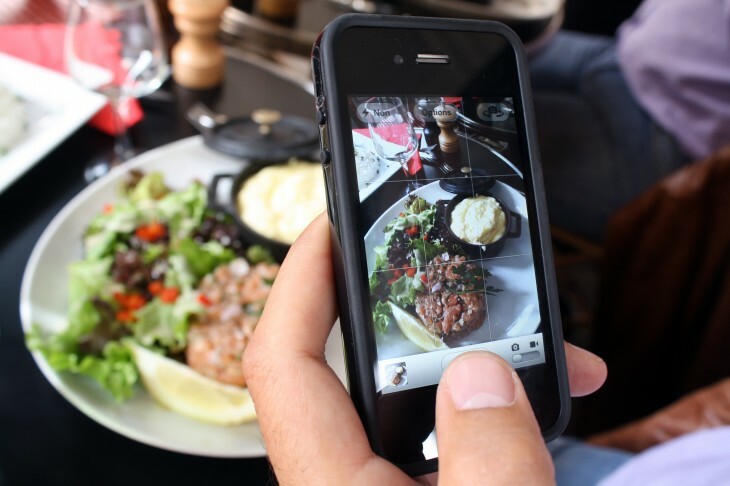 Instagram is here to stay, and rightly so. Google’s homegrown social network is yet to find the mainstream success enjoyed by Facebook or Twitter, but it’s quickly grown into one of the most engaging platforms for sharing and enjoying photography. 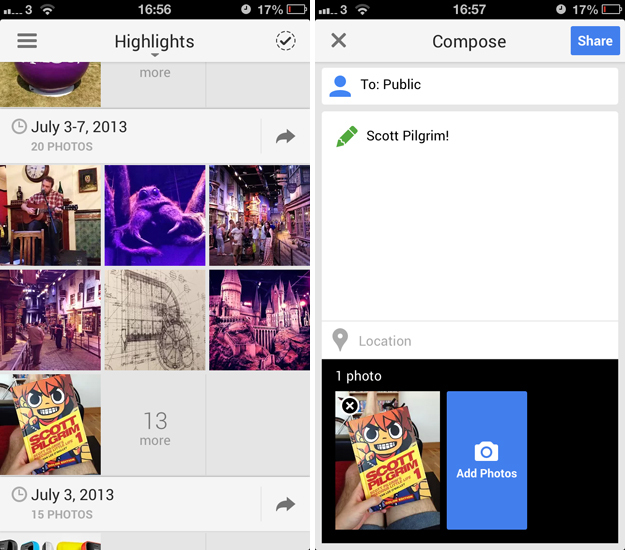 Images look fantastic on Google+. Files are stored in their original resolution and the galleries and individual photo pages are beautiful to browse. The iOS app can be set to upload all of the images in your Camera Roll automatically – and it’s also incredibly easy to share a batch of photos both publicly and to specific circles.